New expectant parents should register at the Parish Center prior to the child's birth for a Baptism Formation Class. Call the Parish Center to sign up for this class. To schedule a baptism, please call Stephanie at the Parish Center 920-533-4441. Baptisms take place after Mass on the 4th weekend of the month. Reconciliation hours are Saturday evening from 3:30-4pm at St. Matthew Church or by personal appointment. Please call the Parish Center if you wish to make an appointment with Father Mark. For more information, please call the Parish Center at 533-4441. If there is an emergency, please contact Father Mark at 262-752-7646. Engaged couples should begin preparations at least six months prior to your wedding date. 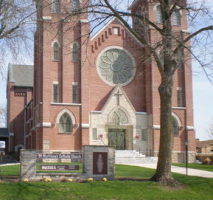 Please call the Parish Center at 533-4441 and speak with Stephanie to set up a time to meet with Father Mark. Our confirmation of high school students takes place during junior year. Please see our Life Teen page under Religious Education for more information on the requirements.